From 1776 until the present day, July 4th has been celebrated as the birth of American independence, with festivities ranging from fireworks, parades and concerts to more casual family gatherings and barbecues. On Saturday, July 4, folks from all over the Big Walnut area will gather in Sunbury for their own version of the annual holiday, the 2015 Sunbury Independence Day Celebration. The day begins early, with the 7 a.m. to 3 p.m. Antiques, Arts & Crafts Fair on the Square. The Sunbury/Big Walnut Area Chamber of Commerce sponsors the Antiques, Arts & Crafts Fair. For vendor information and contracts go to the Sunbury/Big Walnut Area Chamber of Commerce website at < sunburybigwalnutchamber.com >, click Events, click Events List in the drop-down menu, scroll down to 2015 Fourth of July Celebration, click Read More, then click vendor links. The 2015 Big Walnut 5K Freedom Walk/Run will start and end on Sunbury Square. Registration begins at 6:30 a.m.; the race begins at 7:30 a.m. For additional information or to preregister online go to the Premier Races website at < premierraces.com >, click Events, on the Events page scroll down in the Search box drop-down menu to Sunbury Town Square. At 9 a.m. the 16th Annual Corey Lehman Memorial Volleyball Tournament gets underway at Big Walnut High School. To register for the volleyball tournament go to the Sunbury/Big Walnut Area Chamber of Commerce website at < sunburybigwalnutchamber.com >, click Events, click Events List in the drop-down menu, scroll down to 2015 Fourth of July Celebration, click Read More, then click volleyball tournament information and registration links. At 9:30 a.m. children with decorated Bikes & Trikes should gather at the southwest corner of Granville and Columbus Streets for judging and then enter the parade as it goes by. Sunbury’s 10 a.m. Independence Day Parade, Star Spangled Salute, will honor Vietnam Era Veterans, escorted by the 122nd Army Band, Ohio Army National Guard. Vietnam era veterans who wish to be in the parade are encouraged to contact Donna Evans as soon as possible via email at < memadonna9@yahoo.com >. 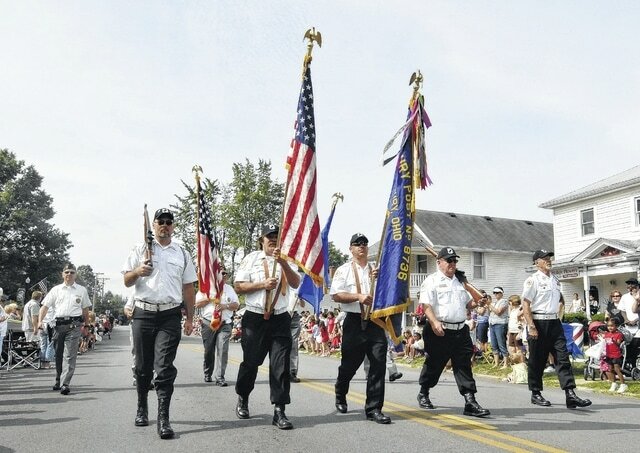 To register a float for the parade go to < sunburybigwalnutchamber.com >, click Events, click Events List in the drop-down menu, scroll down to 2015 Fourth of July Celebration, click Read More, and the click on parade registration link. The Columbus Saints Drum & Bugle Corps will perform on Sunbury Square immediately following the parade; and an 11:30 to 1:30 Community Cookout will be hosted by Wayne Miller, Eagle Auto Repair and the chamber of commerce. Just for children age 10 and under there will be a KidZone on the Square. The 1 p.m. to 3 p.m. KidZone will feature free bounce house fun, fun frolics games and more. Adults must accompany children at all times; adults must pay the $1 square admission charge. Following the parade at approximately 11 a.m. there will be a Football Skills Punt, Pass & Kick Contest at JR Smith Park hosted by members of the Big Walnut Youth Athletic Association. Sign-ups for the 2015 BWYAA football season will be held until 2 p.m. at the park. Youth football registration will remain open until July 6; go to the BWYAA website at < bwyaa.com > for additional information. As always, late in the day activities move to Big Walnut High School for the 6 p.m. to 10 p.m. community party and July Fourth Fireworks Spectacular. When it’s dark enough, at approximately 10 p.m., the event everyone has been waiting for begins, the Big Walnut area’s Community Fireworks display. For additional information about the Sunbury/Big Walnut Area Fourth of July Celebration contact the Sunbury/Big Walnut Area Chamber of Commerce office at 740-965-2860.